The Montane Alpine Stretch Pants are lightweight softshell trousers designed for hill walking and climbing. They have a minimalist design with only the essential features retained and a close fit to reduce excess fabric; all of which contributes to a quoted weight of just 374g. They feature two types of GRANITE STRETCH fabrics; the first of these forms the majority of the trousers and provides some stretch with a small amount of weather resistance (light breeze and very light rain). The second of these is the GRANITE STRETCH Tough fabric across the knees and inside of the ankle. Although this purports to be a stretch fabric, if it does stretch then it is barely noticeable. However it does provide some extra durability for a lightweight pair of trousers. Bringing these two fabrics together are a plethora of seams, most noticeably across the articulated knees. 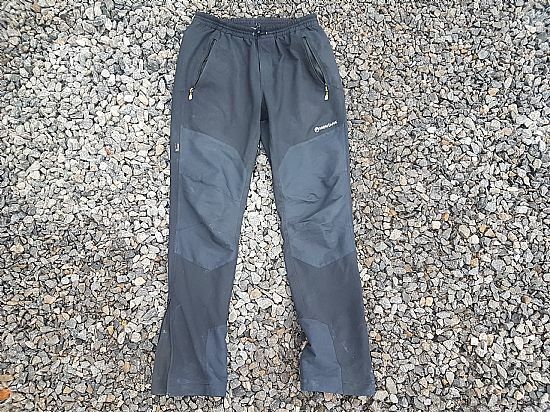 Unfortunately these seams and the stitching quality are the Montane Alpine Stretch Pants weakest point for durability; I can easily count 10 places where the stitching has already ‘blown’ or come loose without any real abrasion to the fabric itself. The Montane Alpine Stretch Pants have an elasticated waist band with a single pull cord to provide additional adjustment. This is great minimalist design; from personal experience this feels comfortable under a harness and rucksack. For those of who care about looks, the draw cord does have an unfortunate habit of protruding directly from the base of your stomach and it does make you look slightly silly. 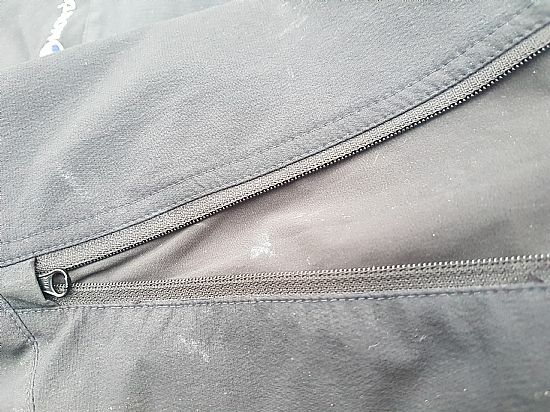 The two zipped hand warmer pockets and rear zipped pocket are fairly standard and have nice large zipper pullers to open and close them (makes life a lot easier when wearing gloves). Although it is worth noting that they do sit under a rucksack waist belt (depending on your rucksack) causing some rubbing on your hips (worth thinking about if you are going to do a lot of trekking for example). 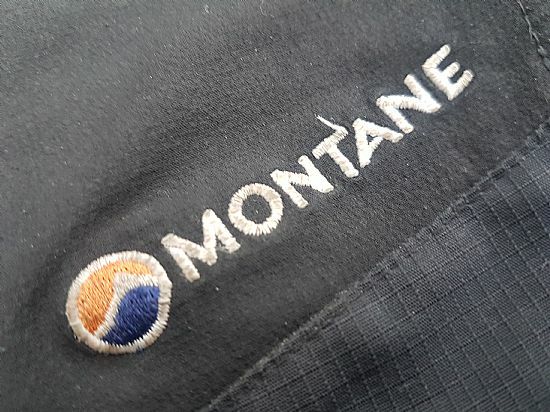 The close fit of the Montane Alpine Stretch Pants is excellent and Montane should really be praised for getting it right when the market demand isn’t always there for slim fit products. This is especially so across the ankles where there are gusseted zips, allowing you to reduce the volume around the calf hem. This is particularly good when out in muddy, wet and / or snowy conditions as it reduces the amount of excess fabric available to mop up dirt and moisture. 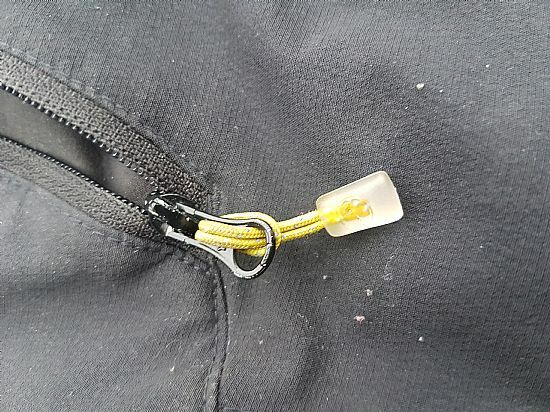 Montane say the Alpine Stretch Pants have a rear chalk bag attachment point, WHY? If they are suggesting you clip a chalk bag on with a carabiner then this is frankly stupid – having a piece of unmalleable metal immediately next to your coccyx is going to lead to very serious injury if you fall on to it. If they are suggesting that your chalk bag belt could go through it, then it is simply too low. Either way just do not use it and Montane please don’t use it as a design feature, it is either unsafe or just makes you look like you don’t really climb. In summary the Montane Alpine Stretch Pants are a great lightweight softshell pant. They are towards the lighter end of the weight and warmth spectrum so they really fall more in to the summer category (depending on your personal preference). The stitching quality and its subsequent lack of durability put a dent in an otherwise excellent product. Minimalist design; only what you need, nothing extraneous and superfluous. Close fit is excellent; only very minimal excess fabric. More durable fabric across key areas (knees and inside of ankles) is a good use of zoned fabric construction. Elasticated waist belt is super comfortable. Plethora of seams is a weak spot for durability (but they have the upside of an excellent articulated knee). Some stretch but not as much as other alternative products. 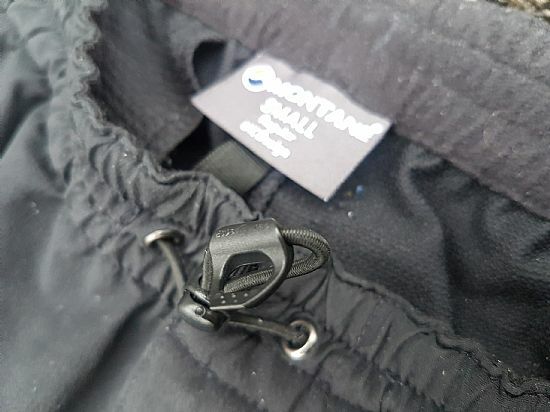 Overall the Montane Alpine Stretch Pants are a great product but it’s a shame the stitching quality is so poor. It is worth bearing in mind that at a retail price of £100 there are cheaper alternatives out there and although it may sound counter intuitive that you are effectively paying for fewer features, it is actually a good thing because the stripped down design reduces weight, pack size and drying time.